Barcelona and Madrid are two very different cities, but both offer wonderful cultural opportunities for families to explore while in Spain. I’m so glad we had a chance to visit both destinations with our kids recently. Here are some highlights of our fun-filled Spanish cultural extravaganza. We kicked off our trip at Hotel Ritz by Belmond. Staying at this landmark hotel with my 20th-century kids made us all reflect upon a bit of European history. The hotel was commissioned by King Alfonso XIII in 1910 and is one of the grand luxury hotels of Europe. The lavish interiors and the scale of its grand salon, where we sipped tea upon our arrival, gave us a glimpse of a bygone era. Breakfast in the elegant dining room in the mornings was a treat as well, and of course the world-class “ritzy” service for which the Ritz is famous certainly allowed us to experience the royal treatment firsthand. We stayed in two beautiful adjoining rooms, ideal for a family of four. The Prado Museum is next door to the Ritz Madrid, and its vast painting and sculpture collections — among the most extensive in the world — are impressive. Although the kids did not have a huge amount of patience for classical painting (or “old-fashioned art,” as they call it), a wide range of kids’ art books and toys in the museum gift shop piqued their interest. Picasso’s anti-war icon, “Guernica,” which hangs at the nearby Museo Reina Sofia, did wow them, however. I think they will always remember the powerful and expressive black and white images. Palacio Real de Madrid, the city’s royal palace, is mind-boggling in size and extravagance. Standing in the Spanish royal halls and touring the enormous private chambers brought the power of the monarchy to life. The elaborate interiors, decorated with floor-to-ceiling fabrics, mammoth crystal chandeliers and intricate antique furnishings, are incredibly grand and a must-see. Retiro Park, also a short walk from the Ritz, provides endless opportunities for family fun. The park is abuzz with rowboats, places to run and play, and bustling cafés to enjoy lunch or a hot chocolate. We brought a soccer ball and spent a day weaving in and out of the well-manicured maze-like paths. Barcelona a little over an hour from Madrid by plane, was the next stop on our Spanish holiday. The city feels quite urban but is perched on the Mediterranean Sea. The fact that we could go to the beach in February was a real treat. It wasn’t balmy, but it was warm enough to kick a soccer ball around and feel a light sea breeze. Barcelona is also a great city for walking, with many vast pedestrian areas. We loved strolling up the famous Las Ramblas boulevard, people-watching and snacking on churros dipped in chocolate along the way. Staying at Splendom Suites, an aparthotel in the Eixample district, really made us feel like locals. The neighborhood was residential and quiet, yet near enough to many impressive sights, including Gaudi’s eccentric masterpieces a short walk away. We had a two-room apartment, which was well designed and tastefully decorated. It had a complete kitchen (with a Nespresso machine for Mom) and even a washing machine. When traveling with kids like mine, whose churros dipped in chocolate wind up dripping on shirts, that can be a lifesaver. La Sagrada Família, Gaudi’s magnificent cathedral, is a sight to behold. Construction on the building started in 1882 and is not yet finished. It has a contemporary design, which especially appeals to kids. Standing inside the white stone structure, flooded with colorful reflections from vibrant stained glass windows, really is otherworldly. The artistry made a powerful impression on all of us. Another Gaudi masterpiece is Park Guell. There are many lovely paths for walking, benches for picnicking and even some little cafes where you can dine with a panoramic view of the city. Wandering through Old Town’s narrow streets, window shopping and ducking in and out of tapas spots, was also great fun for the family. The Picasso Museum is tucked in the Born (Old Town). It’s small, so you can see the whole museum in less than an hour, making it an easy family-friendly cultural stop. My kids loved seeing his early sketches. One of our favorite sights was the music center, Palau de la Música Catalana, which has to be the most fanciful modernist building in Europe. Its elaborate mosaic pillars and a stunning stained-glass dome window inside make it a spectacular place to visit, or better yet, see a concert. Deluxe accommodations, museums and palaces aside, if you asked my kids which cultural experience in Spain was their favorite, they’d vote hands down for the FC Barcelona football (soccer) match at Camp Nou, Barcelona’s impressive outdoor stadium. Team star Leo Messi made a hat trick, and though we were in a crowd of nearly 100,000 people, of course the kids like to believe it was just for them, in honor of our family’s visit to Spain. TIP: Purchasing tickets to La Sagrada Familia, the Picasso Museum and FC Barcelona matches/Camp Nou will help to ensure access and save time standing in line. Need more comprehensive guidance? CB! Vacation Consultants specialize in helping families book travel to top destinations around the world. 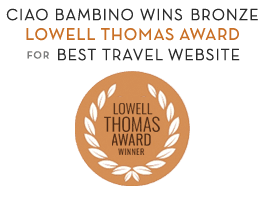 Our expert consultants do everything from recommending and booking accommodations (including a qualified options not featured on Ciao Bambino) to developing comprehensive multi-stop itineraries, including activities and vetted guides. For more information and to request assistance, go to the CB! Vacation Consultants page. Editor’s Note: The Ritz Madrid and Splendom Suites provided Ciao Bambino with a media package to facilitate our review. As always, our opinions are our own. Photos by Lee Rose Emery.